Caring.com has helped thousands of families find high-quality senior care. To speak with one of our Family Advisors about memory care options and costs in Mccracken County, call (855) 863-8283. Mccracken County, Kentucky, is part of the Jackson Purchase, an area bordered by the Mississippi, Ohio and Tennessee Rivers. Kentucky has around 86,000 seniors living with Alzheimer's disease, and with nearly 20 percent of the residents of Mccracken County aged 65 or over, two memory care facilities are available locally to support seniors who are living with Alzheimer's or other dementias. It's standard practice for memory care facilities in Mccracken County, and all of Kentucky, to be annually certified by the Kentucky Department for Aging and Independent Living. The cost of living in Mccracken County is almost 20 percent lower than the national average, which is good news for seniors looking for memory care here. Healthcare is also lower than the national average, albeit just a few percentage points. It's unlikely that the air in Mccracken County will pose a risk to seniors living with respiratory conditions. The American Lung Association has awarded this county a rating of "B" in its ozone pollution category and a rating of "A" in its particle pollution category. Mccracken County was also awarded a "pass" rating in the annual particle pollution category. Mccracken County has, on average, 198 sunny days per year, compared to the national average of 205 sunny days per year. Winters here can be severe, so it's a good idea to check that loved ones in memory care are kept safe and comfortable during the coldest months. On a scale of one to 100, where one represents the safest, violent crime in Mccracken County scores 48.5 and property crime scores 51.1. When compared to the respective national averages of 31.1 and 38.1. As these rates are considerably higher than the national averages, families may get increased peace of mind by discussing the security features present at each individual facility. Memory Care costs in Mccracken County start around $0 per month on average, while the nationwide average cost of memory care is $4,753 per month. It’s important to note that memory care rates in Mccracken County and the surrounding suburbs can vary widely based on factors such as location, the level of care needed, apartment size and the types of amenities offered at each community. Mccracken County and the surrounding area are home to numerous government agencies and non-profit organizations offering help for seniors searching for or currently residing in an assisted living community. These organizations can also provide assistance in a number of other eldercare services such as geriatric care management, elder law advice, estate planning, finding home care and health and wellness programs. To see a list of free memory care resources in Mccracken County, please visit our Assisted Living in Kentucky page. 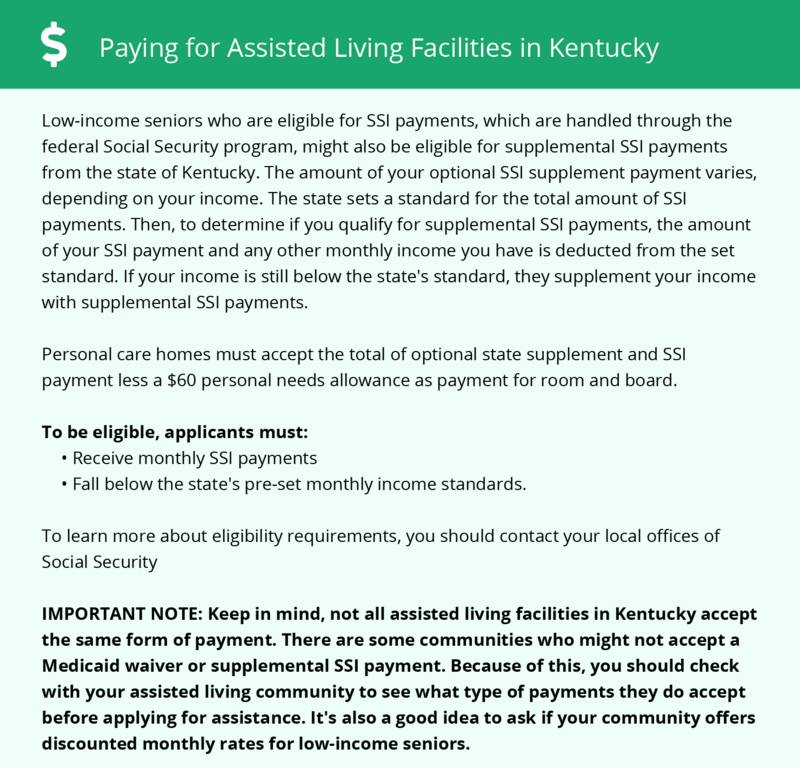 Mccracken County-area assisted living communities must adhere to the comprehensive set of state laws and regulations that all assisted living communities in Kentucky are required to follow. Visit our Memory Care in Kentucky page for more information about these laws.